A bit behind schedule but it's pouring right now...was a pretty nice day after all. This is a really great photo, Ron. You have such a nice view from your apartment. It's still raining over here at almost 9:00 PM. 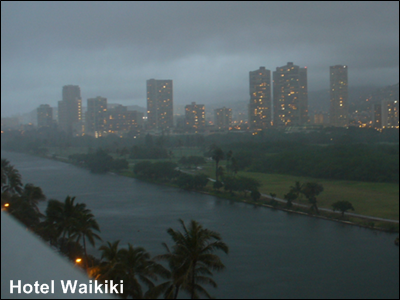 That is a lovely shot... Ala Wai Canal... I remember when there were only a few hotels nearby...and people fishing in the canal. Nate- still the best weather on the planet. And about the only way we get water for drink. Kay- view's great, but there's the steady drone of traffic off the Ala Wai Blvd. Actually you don't notice it until when you're inside an apt on the opposite side of the building which has no view. Cannot have everything. Mokihana- people still fish in the Ala Wai but they only catch rubbah tires. You heard about the large mantis shrimp they caught a few years ago dredging the canal. Still get the million or so tilapia in the Ala Wai?